The markets are 6% down. And in the carnage we saw it move from a bad open, to a worse mid-day, to an absolutely terrible afternoon. 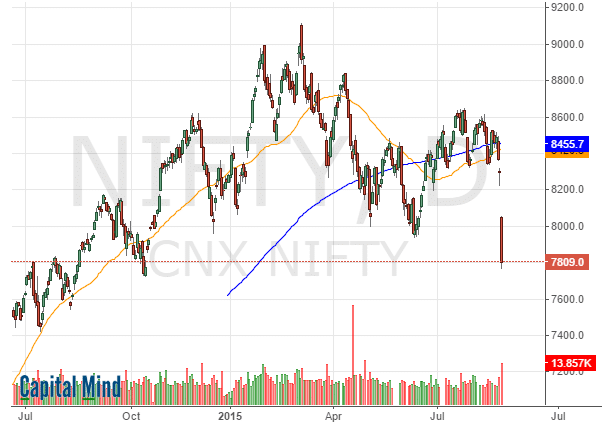 The Nifty sank to nearly the lowest in a year (we went briefly below this level in Oct 2014). This is not Normal of course. And markets haven’t tanked this much since…January 2009! 1/ This has not been an easy day. It seems to be that investors have panicked. We’ll know who and when and how later. 2/ There would have been margin calls, panic selling, lower circuits and what not. This would have fed into even more selling. 3/ There wasn’t a letting up, right to the end. Which means it’s unlikely to be “speculators” that drove the markets down. 4/ There will be no end to reasons but it’s just this – just because markets have been calm recently, doesn’t mean they stay calm. 5/ One Aug 21 (or Jan 21, 2008) can drive a lot of fear, but this is how markets are and supposed to be. 7/ For the shorter term trader, it teaches the power of a stop loss. You never forget a lesson taught in this way. 8/ Stay calm because there’s no point to panicking. If you feel jittery, sell to the point where the jitters are gone. 10/ Lastly, the focus is about who you are: A long term value person? Good market. Trader who was long? Tough market, but stop loss. The gyrations in the US and European markets show that this isn’t a failure of Modi’s government or issues with too much traffic in your city. It’s a little more global than that. Foreign investors pulled out more than Rs. 5,000 cr. in cash markets today. The Rupee has fallen to Rs. 66.65 to a dollar. There’s blood on Dalal Street, because investors are out. Remember that every fall brings in more falls, because leveraged players have to unwind positions. Higher volatility means higher margins. A Nifty futures contract which took Rs. 16,000 will take Rs. 22,000 tomorrow, and possibly Rs. 25,000 the day after. A person who has six contracts with his Rs. 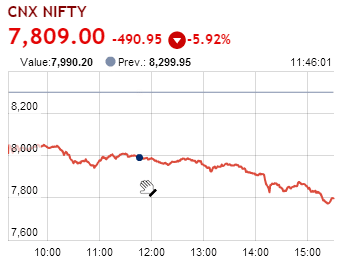 100,000 not only saw a 5% drop in the Nifty – wiping out Rs. 60,000 of his capital bringing it to Rs. 40,000 – but also an increased margin demand of Rs. 150,000. With his Rs. 40,000 he has to produce another Rs. 110,000 to remain in the game – and if he doesn’t bring the money, the broker will sell his contracts, which triggers even more falls. The first day of a large fall doesn’t usually trigger all the falls – many brokers allow their clients a one-day gesture to bring in the money, or use their stocks as margin. But what if the stocks also have fallen 10%? They’ll sell down the stocks in subsequent days. The margin cycle continues for at least a day or two. Selling frenzies feed on themselves and it’s perhaps incorrect to assume they last only for a single day. At Capital Mind Premium, we had to exit many positions at a stop loss. Even so, we are much better off now than we would have been had we stayed in. But the point isn’t that at all – even if there is a sharp move back up, it would be sheer indiscipline to ignore strong stop losses. It’s not correct to base investing on hope. Hope is not a strategy. The only strategy is: If this happens, I will do that. If that happens, I will do this. Replace the “this” and “that” by appropriate terms. A stop loss is simply: If the price falls to X, I will exit. And we did, and we might regret it but there will never be a regret for not knowing what to do. At best, we can plan our reaction. Nothing told us – or anyone else – that a 5.9% day was possible, probable, or even visible. India’s data has been bad for ages. China’s been going down most of last week. The US Dow routinely moves around. You don’t have a 5% down day for these reasons alone. There’s something more; probably fatigue, probably overreaction and probably a market’s desire to show its true nature. Whatever it is, the essence of what you do defines you as a market participant. If you are a short term trader, you want this volatility to give you sustained opportunities on the short side perhaps. You want markets to go to extremes so you have a safer short term move. The longer term investor must be happy. At Rs. 66.65 all the pharma names and IT names must be exciting! Why not, as they are likely to profit big time from the move ahead. Or, you might wonder why an auto parts exporter like Motherson Sumi gets hurt so bad. Or the likes of Balkrishna Industries whose export, off-road tyres, is made from rubber/crude whose prices are falling, and yields dollars/euros, whose prices in rupees are going up. You’ve stayed out when prices were too high, and the selling frenzy might just let you find the players you can buy without losing much sleep. As a passive investor, if you are one, note that you shouldn’t even be reading till here. You shouldn’t care. Your business is to do what you do best, not bother about markets. You chose to invest with mutual funds, let them decide. There’s no one-day data from them that will help you. If you need to evaluate their performance, wait till the end of the year. Such days like today are just blips in the larger scheme of things. Tomorrow will be another day, just as today was. And in a time of extreme tension, note that exiting your positions just because people on news channels (including me) look very worried, or that because there are BIG BOLD RED headlines tomorrow, is useless. Plan your reactions, and when you do, you will know if you’re panicking. The market, it doesn’t love you back, so there should be no loyalty involved…but at the same time, you have to walk away for the right reasons.